Thunderstorms are a worry for every business that relies on weighbridges in some capacity. Lightning doesn't have to hit your weighbridge directly to cause damage. 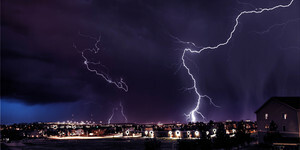 Lightning strikes are just an inch in diameter, and often equipment damage can be caused by the electromagnetic pulse generated by the strike, or from the current jumping across from the initial strike point. Disconnect any weighbridge indicators overnight, or when the storm approaches. If you're unsure how to do this, just give us a call and we'll happily talk you through it. Note that this won't protect it entirely, it just means one less route for the charge to go through. Lightning DOES strike the same place twice. Many factors can affect what lightning is attracted to in a given area, which means some weighbridges can appear more "prone" to lightning strikes than others. Don't assume you're safe because it's been hit before! Allweighs Weighing Services will always give you a free, unbiased assessment of exactly what equipment has been affected and what hasn't. Always get a second opinion - just because your weighbridge has stopped working definitely does not mean every load cell has been damaged (often, it's just one). Let us test them all and make sure you're not paying more than you need to. If maintenance is needed, we can also carry out a full weighbridge calibration to ensure you're up and running to trade standard as quickly as possible. We offer a full range of weighbridge hire, sales, maintenance and calibration services. Give us a call or contact us via the website for a quote today. Lightning photo courtesy of www.freerangestock.com. Article by Rob Scott.